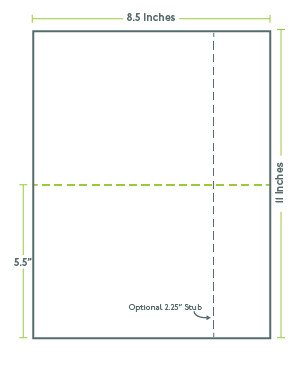 1 col x 2 rows 8.5"x11"
The dimensions of this 8.5" x 11" perforated paper are ideal for printing invoices, brochures, billing statements, invitations, and more. Configured in 1 column by 2 rows, each sheet produces 2 pieces measuring 8.5" x 5.5" and is available in a number of different paper colors and stocks. Last but not least, micro-perforation between each segment means you’ll get a clean tear. Available in many paper colors, including blue, orange, yellow, and pink. 8.5-inch by 11-inch paper, perfed with 1 col and 2 rows. Usable in most laser and inkjet printers, as well as in copy machines. Expect excellent quality at a fantastic price on PerforatedPaper.com!